It is commonplace for fans to look for excuses when their team loses a game in the playoffs. Whether it be lack of rest or bad bounces, there will always be a section of a team’s fanbase looking for somewhere to place the blame. The most prevalent excuse is poor officiating. It is worth noting that despite any perceived impact by the officials, the better team is usually the one that wins the game. 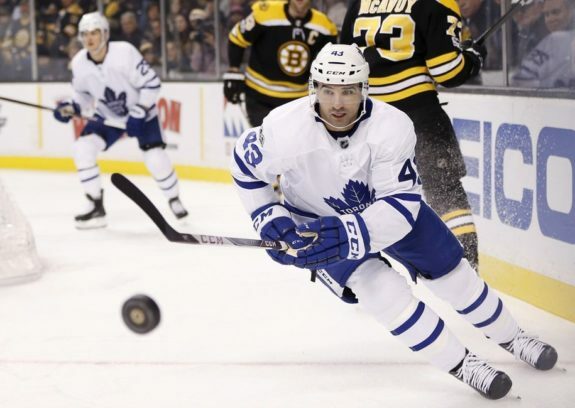 While this is a problem league-wide, here we will take an in depth look at Game 2 of the Toronto Maple Leafs first round series against the Boston Bruins. The Bruins were the better team all night long, outscoring and out-working the Leafs with relative ease. They forced Toronto to play the game their way and it did not go well for the Maple Leafs. The game also served as a microcosm of the problems with playoff officiating as a whole. One would think that a team that plays fast and skilled would draw more penalties than average. The team’s style of play would be ideal for drawing hooking and tripping penalties as their opponents would often be forced to resort to such tactics to try and slow the game down. However, that is not the case. This graph illustrates the correlation between the number of penalties a team takes and how many they draw. 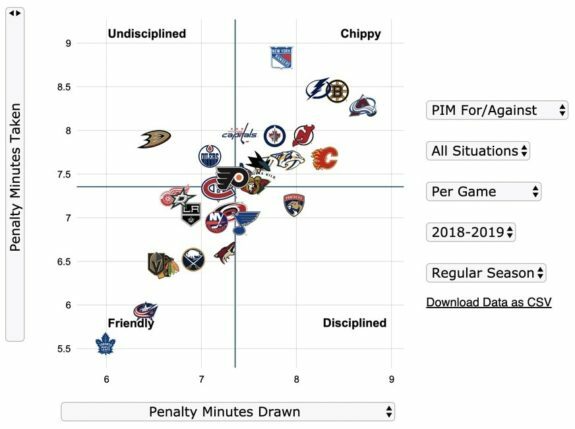 The left side represents the average penalty minutes each team took during the 2018-19 regular season. The higher a team sits on the graph, the more penalty minutes they took. The bottom represents the average penalty minutes each team drew. The farther a team sits to the right means they were able to draw more penalties than those to the left. These stats are from this regular season and they show that the Maple Leafs were the team that had the fewest penalty minutes drawn and taken by far. This would not be as much of an issue if the rest of the league did not follow the same trajectory. Because Toronto plays a style less likely to result in penalties, the officials are also refereeing their opponents with the same eyes. The graph shows a straight line going from the bottom left to the top right, meaning that the referees are more likely to try and call a balanced number of penalties than actually following the rulebook. Perhaps the perfect example of this came in the first period when Nazem Kadri and Jake DeBrusk got tangled up and DeBrusk gave Kadri a few shots to the face. Despite not retaliating, Kadri found himself in the box alongside DeBrusk with a roughing penalty. Where this really becomes an issue is when the Leafs play a team at the other end of the spectrum, such as the Bruins. The Bruins are known for being one of the roughest and toughest teams in the NHL, a status that has been earned by years of chippy play. When the Maple Leafs and the Bruins play, the Bruins should be receiving close to three penalty minutes more than the Leafs. That is not the case. 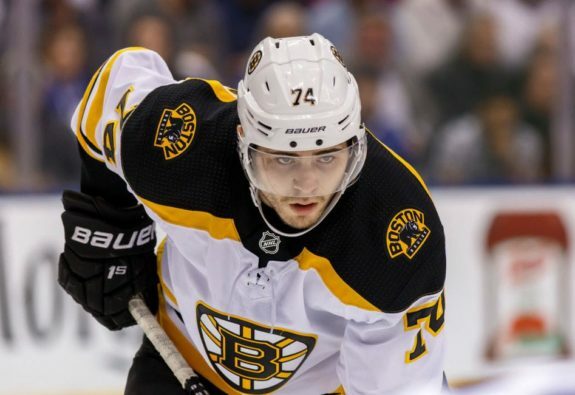 By attempting to call penalties equally, the referees have allowed the Bruins to play their style of play with little fear of being reprimanded. Credit to the Bruins, they have been able to learn how to use this to their advantage for the better part of the last decade. Referees are more lenient with calls in the playoffs. What would normally be a slashing or hooking penalty is less likely to be called in these high-stakes games. While this is widely accepted, it does stand to raise an issue when the penalties being ignored go from hooking and slashing to elbowing and interference. There are a pair of problems with the philosophy of putting the whistles away for the playoffs. First, calls are obviously missed. Second, things tend to escalate. The first leads to the second if left unchecked. Throughout the game there were a number of major calls that went unnoticed on both sides. The most talked about one being DeBrusk’s knee-on-knee hit to Kadri. While analysts discussed whether or not it should have been a penalty, this was arguably the tipping point in a game that had seen over a half-dozen missed calls. The notion that hockey in the regular season and hockey in the playoffs should be called by different rules is a bizarre one. It is the exact same game played by the exact same people, yet the rules stop being enforced when they arguably matter the most. Imagine if in the MLB postseason the umpires stopped enforcing rules involving the defensive team obstructing the baselines. If all of a sudden a first baseman could block the path of the hitter to first base without any repercussions, it would change the game entirely. It would not make sense then, so why should it make sense in the NHL? The bigger problem in this situation is escalation. While these players are grown men and should be able to utilize restraint in these situations, it is also the job of the officials to minimize incidents like we saw in this game. Due to the back-and-forth play between Kadri and DeBrusk, by the time DeBrusk delivered a hit to Patrick Marleau, Kadri had enough. He crosschecked DeBrusk, resulting in a match penalty and a suspension lasting the remainder of the first round. This was not a smart thing to do by any means. Kadri is a repeat offender and this incident had Brian Burke questioning whether he will receive as much as a five-game suspension. DeBrusk had gotten under his skin, but Kadri needed to keep his cool in this game and he did not. His outburst here cost the Leafs one of their best forwards for the rest of the first round. He essentially sealed Toronto’s fate in the game as the five-minute major lasted for most of the remaining third period. If the game had been properly policed and had penalties been enforced, it is far less likely that this situation happens. To reiterate, the Maple Leafs did not deserve to win this game. Much of the team failed to show up and the Bruins dictated the pace of the game, which led to a dominant performance. That play was compounded by mistakes made by William Nylander and a big mistake from Kadri that has fans getting feelings of deja vu, as discussed by SportsNet’s Chris Johnston. That does not excuse the officiating that was on full display at TD Garden. The issues with playoff hockey were illustrated perfectly throughout this entire game and it seems very unlikely that these issues will be fixed anytime soon. Twice a week we'll email you a few of our best posts. Easy one-click cancelation if you see it's not for you (but we think you'll love it).